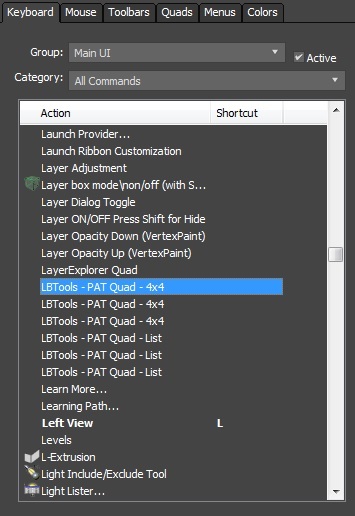 Pivot & Align Tools (PAT) are a set of macros bundled into a quad menu that allow you to perform various object alignment, pivot alignment and object snapping functions, among others. Most of the functions can operate on a selection of multiple objects at once. A 4x4 quad version is also available. === About ===: Displays contact and version information. Reset Pivot: Resets the pivot of a selected object to its original position and orientation when first created. Same as the hierarchy panel version. There are two styles of layout for the quad menus: List (single quadrant) and 4x4 (all quadrants). Both are available under the Quads tab in Customize. You can assign hotkeys to both of them or just your preferred one. - Changed the "Pivot World" function to use ResetTransform. - Added "Reset Pivot" function - uses the standard reset pivot found in the hierarchy panel. - Align Average Pivots and Align Average Centers now work on CAT rigs and Biped parts as picked target objects. - Removed the menuman.setShowAllQuads call as it was interfering with the "Show All Quads" interface option for LBTools - PAT Quad - 4x4. Note that this still may not work - you may need to rebuild your custom workspace from scratch to get it working (a Max interface issue). - Added a new option "Pivot Max Z" which moves the pivot to the maximum bounding box Z position. - Added a new option "Pivot World" which aligns only the pivot to the world orientation. - Fixed some bugs with picking objects. - Quad-menu items are now active when nothing is selected. Instead, selection catches have been added which display message boxes. - Added a Reset Scale function. Same as reset scale in the hierarchy panel, but also works on hierarchies - unlike the standard version. - Added an About panel for contact and version info. The two quad-menus can be found under the Quads tab in Customize. Assign hotkeys to one or both of them. Drag the MZP file into your Max viewport. A restart will be required to initialize the quad-menus. Submitted by spartacus on Wed, 2019-03-13 12:41. I made a new menu with all the List options and assign a keyboard shortcut to it on Keyboard tab, now it's saving. I formatted my PC and after installing 3ds max 2018 I just installed your plugin without any other plugins and the same error appeared, I even tried with Update 1, 2 and 4 but nothing. I opened the file that you mentioned but there's only one entry for Quad and List I even used CTRL + F to search for it. The funny thing through it was working without any problem before, now I don't know what's happening. My problem isn't that it's showing duplicate menus but that it isn't saving the keyboard shortcut. Sorry for any mistakes on my english. Submitted by lbrooks on Thu, 2019-02-28 17:06. Hi, I'm not having any issues with my installation and I can't reproduce the problem. You might need to edit your auto-saved .mnux file in ... \AppData\Local\Autodesk\3dsMax\\ENU\en-US\UI\Workspaces\usersave\ ... for example, mine saves to ... Workspace1__usersave__.mnux. ... and also update the menuID's so they're sequential again. That should fix it from then on. Submitted by spartacus on Thu, 2019-02-28 14:14.
and now I have 6 menus in my list. Submitted by grishunin08 on Mon, 2019-01-28 03:33. You can find out the reason, the script constantly creates a new menu of itself. Submitted by mohamed_6482 on Wed, 2018-10-31 22:35. Submitted by lbrooks on Wed, 2018-10-31 17:56. Hi, sorry I misunderstood the original problem. I had a play with trying to get this working and had some success in 2016, but not 2019. It seems Max's interface doesn't always play nice with this option when assigned to a shortcut. To get it working (in 2016), I saved both my custom workspace and Custom UI Scheme after assigning the shortcut and turning on show all quads, and restarted Max. I've removed some lines of code (in 1.3) that may have prevented the show all quads from working as expected. However, to get it working you may need to start from a fresh default workspace then install the script and try setting up a new custom UI. Submitted by mohamed_6482 on Tue, 2018-10-30 20:17. Submitted by lbrooks on Sun, 2018-10-28 23:51. This should be fixed now in version 1.1. The quad items are now clickable even when nothing is selected. Submitted by mohamed_6482 on Sat, 2018-10-27 20:01.